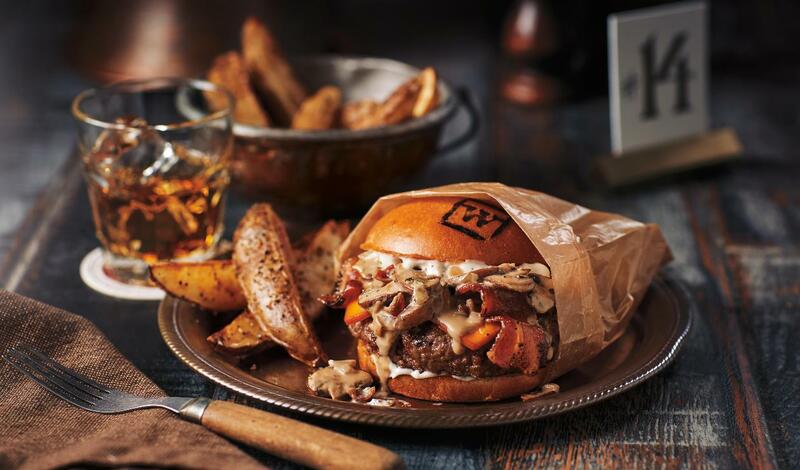 An all-beef patty toped with smoked cheddar cheese, crispy bacon slices, creamy mushroom sauce and bourbon mayonnaise. Simmer 1.5 cups bourbon until reduced by half. Combine Hellmann's® Real Mayonnaise, reduced bourbon and pepper; whish to incorporate. In excess bacon grease and butter, sauté onions and mushrooms until slightly softened. Add garlic and deglaze with bourbon. Add cream and rosemary and simmer until reduced and slightly thickened, about 5 minutes. Season to taste with salt and pepper. Hold hot for service. Cook the burgersto desired doneness, top with cheese until melted. To assemble, spread 1 Tbsp Bourbon Mayo on each side of the bun, then top with Bourbon-Mushroom Sauce and top of bun.